Join us next Monday, Jan. 18 at 7 p.m. for readings from some of Issue 6’s Michigan contributors at Literati Bookstore, 124 E. Washington, Ann Arbor, MI 48104. Michael Zadoorian is the author of two novels, The Leisure Seeker (William Morrow, 2009) and Second Hand (W.W. Norton, 2000), and a story collection, The Lost Tiki Palaces of Detroit (Wayne State University Press, 2009). He is a recipient of a Kresge Artist Fellowship in the Literary Arts, Columbia University’s Anahid Literary Award, the Michigan Notable Book award, the Great Lakes Colleges Association New Writers Award and was long-listed for the International IMPAC Dublin Literary Award. His work has been published in The Literary Review, Beloit Fiction Journal, American Short Fiction, North American Review and Detroit Noir. Lynn Pattison, former teacher of the Gifted & Talented in Kalamazoo Pub­lic Schools, attended the University of Michigan and WMU. Pattison’s poems have appeared in The Notre Dame Review, Rhino, Atlanta Review, Har­pur Palate, Rattle and Poetry East, among others, and been anthologized in several venues. Nominated twice for a Pushcart Prize, she is the author of two chapbooks: tesla’s daughter (March St. Press, 2005); Walking Back the Cat (Bright Hill Press, 2006) and a book, Light That Sounds Like Breaking (Mayapple Press, 2006). Robert James Russell is the author of the novel Mesilla (Dock Street Press), and the chapbookDon’t Ask Me to Spell It Out (WhiskeyPaper Press). He is a founding editor of the literary journalsMidwestern Gothic and CHEAP POP. You can find him online at robertjamesrussell.com. 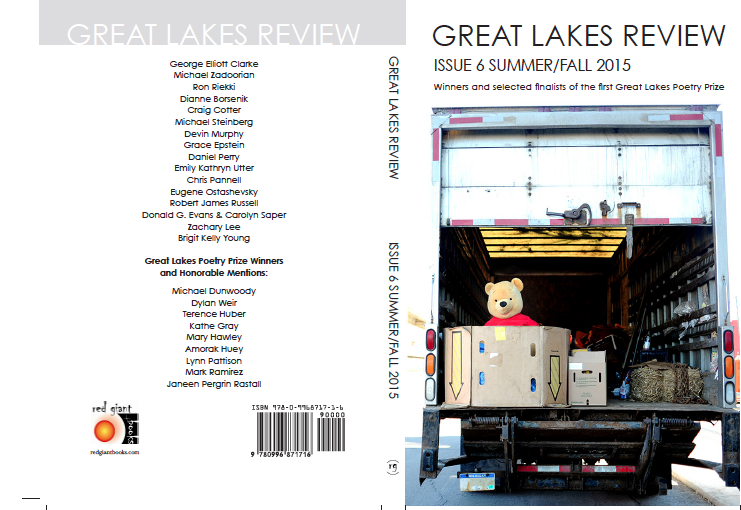 To purchase a copy of issue 6, visit http://greatlakesreview.org/current-issue. GLR: What’s happened since the book has come out? JB: I was thinking about my younger self, and those visions that when you have your first book everything is going to change, knowing even as I was creating that fantasy that it wasn’t true. It’s been fun to realize how wrong my fantasy was. I’m teaching every day, and taking care of my son. Inside that are a few readings here and there… Life continues as it does and writing is a practice more than a product. It doesn’t really change my daily world view except I feel a little bit more part of the poetry community and when I go to AWP I’ll be at a couple of book tables and events. It’s taken so long for this book to come out that I’m working on several other writing projects. I’m hoping to read in my hometown this summer, that’s in the works. GLR: To take Ohio back to Ohio. Will it be like when you translate a translation, that it might not even be recognizable to the people that it’s about? JB: I’m really curious! I grew up in this small town and never moved until college. I haven’t been back in ten years, even though it’s only three hours from where I am now. I had school friends from Mount Vernon who I see on Facebook bought the book – maybe people who don’t read a lot of poetry but are still living in that place. I wonder how they’ll experience the book, I hope it’s a good experience. GLR: Anything that gets anyone buying poetry can’t be bad. One of the things I really like in these poems is this contrast between the regionalism, these really concrete places, like the Big Boy or the graveyard where kids eat ice cream, but then you have Oz and Wonderland, and fantasy characters like Johnny Appleseed, Jonah and the Whale. Is that trying to put some magic into the real place? JB: I definitely am. Part of my experience growing up in Ohio was fairly – I don’t want to say banal, but there’s this – flatness. This everyday, day-to-day living that was not presumptious in any way. You got up, you had a job to do, you did it, you came home and went to bed. In Central Ohio there aren’t as many models of difference or otherness as in a big city. GLR: So you get those models, as a kid, from books instead? GLR You said that having the book come out makes you feel a little more connected to the poetry community, and people have great stuff to say, do you feel like you fit in with a school of writers? Are people doing same things that you relate to? 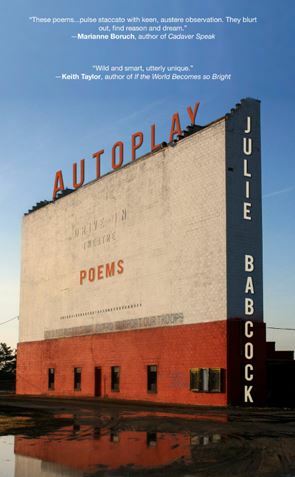 JB: This notion of poetry schools and affiliations, hanging out with poets has helped me to understand that I can be obsessed with what I am, that I don’t need to worry about how it connects to ideas about poetry, and that strangely enough that brings me closer to the conversations that they’re having rather than if I made some theorist move to situate myself. GLR: It sounds like that allows you to commit to your own voice whether it snaps into place with someone else’s dogma. JB: Yes. Part of my teaching is getting students to listen to their own concerns, pay attention to those and figure out what they’re curious about to broaden that conversation and understand “I am a part of this conversation and I want to know how this works.” My journey as a poet has strangely been to become more conscious of what I’m particularly doing so I can see the way my work resonates with what other poets are doing, rather than the other way around. GLR: You’re publishing fiction, too. Did you study both? JB: I did! I’ve always written poetry and fiction. I’ve always loved writing. I taught myself to read from Shel Silverstein’s “Where the Sidewalk Ends.” I have that book memorized still, I performed those poems. I won a second grade talent show for performing “Paul Bunyan” in overalls and a flannel shirt… there was a grainy picture in the Mount Vernon News. Anyway, I got an MFA in poetry and went on to do a PhD in Fiction at University of Illinois Chicago. A lot of places where they have Creative Writing PhDs, writing is separated from lit studies. At UIC there are workshops but there’s a huge literature component. So I have graduate degrees in both. GLR: I saw on the University of Michigan website that one of your interests is Women’s Studies. Let’s talk about that in terms of AUTOPLAY, because you have some delightful and tough girl and women characters here. JB: That idea of being set up in an established system, a daily thing that you’re supposed to take for granted and not question, is something that can be really devastating when you’re not in a position of power. JB: Right. Or these are things you just have to put up with, these are realities of your life as a woman or girl. And then trying to imagine outside of that is double challenging. I think the poems in here where girls, mostly, are experiencing some kind of violence whether it’s sexual or an uneasy kind of familial structure. Giving voice to that tension really concerns me. Thinking about, how do you live in a small town or place with expectations on how power in relationships is supposed to go. GLR: Tell me about the process of putting AUTOPLAY together. A lot of the poems have appeared in journals, and I know the title changed, and I heard you say at a reading at Literati Books in Ann Arbor that an editor suggested you add more poems. JB: It’s hard for me to say how long I’ve been working on this book, because I’m not sure how long it has been this book and when it was an earlier, different project. The earliest poems in there are the persona poems, I’ve always been attracted to that form. So there’s one in there about Alice in Wonderland, one about Pinocchio. Those are older pieces, then skipping some time to about four years ago my brother graduated from Ohio State and John Glenn was the speaker. At that point I was really thinking about astronauts, and I was sitting in the stadium, trying to amuse myself as graduation went on and on, and I was thinking about the phrase “Astronaut Ohio.” I came up with that phrase and concept at my brother’s graduation, listening to John Glenn, and it was at that moment that I really understood what kind of collection I was writing and that it was much more about place than I thought. Those earlier poems with Pinocchio and Alice were sort of place-less, their stories from two different countries. GLR: The finished book is very rooted in place. JB: That was an important shift for me. And that was how I got the original title, Astronaut Ohio. Then I changed it because editors really liked the collection, but said a title about Ohio was too specific. It seems strange because we experience place in a literal way but also in a psychological way that’s much more united across different localities. While I see this book as being about Ohio, in the shorthand, I also see it as being about a more general place where you’re trying to see more options and having a difficult time bring those options and your reality together. The magical jumps that all human beings are capable of fascinate me, and fill me with a lot of hope, the ways we create and recreate things. GLR: A lot of these characters seem like they’re looking to get away or they’re looking for more? I think that translates to anyone who’s grown up in a small town worldwide, grown up with expectations. You might not have a Big Boy in town, you might not have the same regional touchstones, but the need for more translates. JB Christina Olson was my editor and she was really helpful with this work. She had suggestions about reordering some of the poems at the end of the book, and asking me for more. I added three poems – two are erasures, the only two of that form in the collection. The end poem was originally “Astronaut Ohio,” which I think is an inspirational poem because it’s, like, “I’m gonna get out of this galaxy! I’m gonna do whatever!” I am so interested in those moments, but there’s always something that pulls us back down or tethers us. The last poem now is an acknowledgement of that as well. JB: But still surrounded by water! It’s actually not my most realist poem, either (laughs). I see things I’m obsessed with recur in different ways through different genres… I used to think that I was really sporadic with my tastes and knowledge base. I worried I wasn’t connecting anything, but now when I think about my writing I worry “maybe somebody is gong to notice that I am writing about the same thing over and over again.” Obviously neither one of those is true, but I may have a central thing I can’t stop writing about. GLR: Yet you’ll always find new ways to look at the obsession, and new research. If the longing for adventure is the sun in your mental solar system, you’ll find all sorts of different things orbiting it. JB: I like the idea of orbits. I was at the natural history museum on campus the other day. They have a big piece of meteorite, or a cast or whatever, that you can touch. I’d like to think it’s a real meteorite that I’m touching. You can fine Julie’s book at the Midwestern Gothic website. To the woman in the parking lot of the park, who has found me crushing leaves, smelling them, and looking at the willows: I am giddy because I have identified a poison sumac. 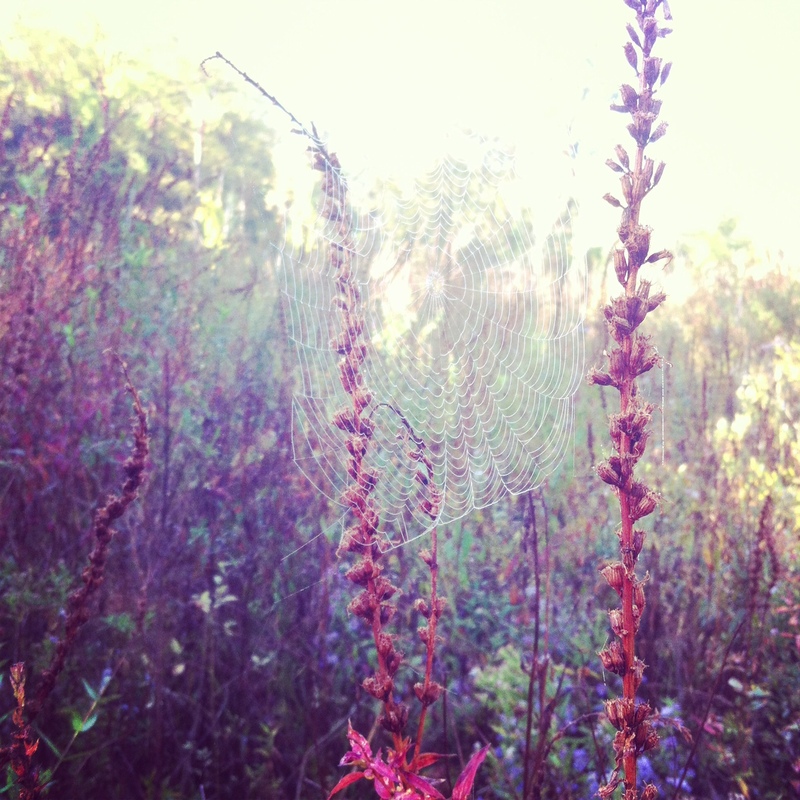 It grows on the trail by the water. They happen in Southeastern Michigan, and here are some ways to tell: Shrub or small tree; leaflets compound, sessile, with scarlet midribs; drupes white, persisting in winter. I have been learning the names of woody plants this fall thanks to a special course at the college in town, a historic course, and sometimes I am overwhelmed with the trees. The distinctions between oaks, the tips of their leaves sometimes bristled, their buds sometimes tomentose, their acorns brimmed with fringe, where they are and aren’t on a hill. And the maples. “Something like Acer,” the graduate instructor says of them, meaning something common, mundane, easy to define. Silver, red, sugar, and box elder, they do their own thing. Thankfully, the Hawthorns one cannot tell apart, by the species at least. They have a thorny, suckering habit. They are part of one another. It is true that they have thorns and haws. The shrubs that creep and climb beneath, I had not noticed. The vines with their special lifestyle, a specialist explains. They adapt; survive in high winds; have special structures. Sometimes, they get a bad rep. A man comes to talk about soil, its micro-biome with elements that outnumber stars. He throws acorns at the students to get their attention. A student asks how we could count the stars; the man explains. I drive to somewhere by Highland Township, and towards Detroit, and to the border with Ohio, to find the right plants. There are places in Ann Arbor I had not considered. Their glacial features. The forest changes. A place that felt common, felt familiar, is not the same place. I’ve only visited the class for weeks, which is to say, I know not much at all. Still, that is all it takes to make the forest strange and lovely, a place to touch and explore. Often the forest is a backdrop. Now, as I walk and scan the paths for bark patterns, and then the understory, the leaves on everything, the way they move with wind, I become the backdrop to the forest. By the end, my senses have exhausted, and I listen. It is the time of year when I can hear the acorns drop, a time of year I hadn’t noticed until now. I am not particularly spiritual, but I am quiet. I think: Once I was an addict. Maybe I still am. In the Mary Karr memoir Lit, she conveys a familiar situation. When in traffic, inching bit by bit, we don’t think of ourselves as it. Traffic is the other humans. Prickles, spines, thorns, I touch plants with all of them. What else can we learn from the woods? I crush leaves, I rub at bud scales. There’s a saying that encapsulates advice for winter identification, after the leaves have dropped: “Trust the bud.” My instinct is to walk away from the forest, the way it’s changed me in weeks. My instinct is not to trust it. I am hoping instead to find a place where I can. A forest in town, perhaps. Anna Prushinskaya’s writing has appeared in Redivider and Sonora Review, and on The Millions and Vol. 1 Brooklyn, among other places. She lives in Ann Arbor, Michigan, and she is also the Midwest editor of Joyland Magazine. Find out even more about her here:http://annavpru.tumblr.com/. The sign greeting motorists says, “Welcome to Whitmore Lake,” set inside a Bob Ross painting of trees and water. I hear the 1973 township board meeting approving the sign. “We are a resort community. We want people to feel relaxed,” the local leaders said. The township board commissions a local artist who probably taught at the high school and died teaching watercolor techniques to senior citizens. The MOTEL sign visible from the freeway is in large block letters. The cinder block motel itself looks like the rooms are giant smoke stains inside. I imagine it as a place of desperation and near-murders, though the parking lot is usually full in the summer when people from all around Detroit come to the lake to hop in boats and pop beers. The lake itself down the street is literally where iconic 8-Mile Road ends. 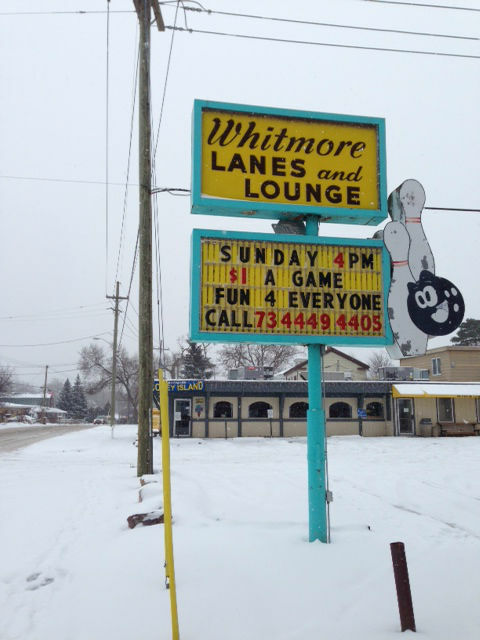 The Whitmore Lanes and Lounge sign along the main drag is yellow with green trim. There’s a bowling ball with a toothy smile and wide cartoon eyes bashing into two pins affixed to a second sign underneath where there is space for changeable announcements. The sentiments switch weekly. “Come out to celebrate Phil and Debbie’s 50th Anniversary on Wednesday!.” “Go Trojans. Good luck against Clinton.” The local high school team mascot is a Trojan. Local businesses hang the red and white school flags in their windows on nights the football team is playing. Condom jokes, of course, are rampant. The Polly Market sign down Main Street is black cursive on a white background and announces the availability of package liquor. It lights up electric red at night. The store is small and dusty. The produce is a gamble. There are 10-year-old desk organizers for sale. In the winter, many of the people in the store have on thick bib overalls and large boots, including the women. The lake is directly across the street and the ice fisherman come out of their shanties and into the market to buy schnapps, beer and energy drinks. As I was standing in the checkout lane one winter evening, the teenager behind me with a hood on his head and a candy bar in his hand knew the cashier, a woman in her late 50s. As she was tallying up my purchases, she said hi to him and asked him how he was. The teen pulled off his hood and said, “I got jumped last night when my car broke down out by the trailer park.” The teen had cuts above his eyes and bruising on his cheeks. The woman gasped. No one else seemed to take notice. He began telling her the story. It’s that kind of town.